This is the second consecutive year in which it feels necessary around the holidays to step back like Chazz Palminteri in The Usual Suspects and take a wide-lens look at the bloodbath that is the 2014-15 Western Conference. This could be the greatest single-season conference in league history — a rumble among at least eight powerhouses with legitimate championship hopes. It may require 50 wins just to make the playoffs, something that has happened only a couple of times before. The hierarchy flips almost daily as injuries, random schedule blips, and crazy games color the perception of each team. A surefire contender one week might look to be in crisis 10 days later. Power-ranking this crew is my version of Ron Burgundy leaping into the bear pit: “I immediately regret this decision.” Consulting with team executives of all stripes didn’t help; they’re just as exasperated, resigned to the cold reality that springtime injuries and head-to-head matchups will determine who survives. This is a futile attempt to sift through early-season story lines and sort teams based upon their championship chances. I’ve taken everything into account,1 with an eye on this question: If everyone is reasonably healthy in April, and you’ve got to bet your life savings on one team rising in the West, which would it be? It’s a lost season for a team that tricked itself into thinking it might contend for a playoff spot if Ricky Rubio, Nikola Pekovic, Kevin Martin, and other key starters remained healthy. That was a pipe dream, and the Wolves will regret tossing the giddy Sixers a Heat first-round pick for Thaddeus Young in the Kevin Love deal. The Cavs and Wolves didn’t need the Sixers to complete the basic trade, and given Miami’s downside — a downside playing out right now — the rebuilding Wolves should have held on to a pick that could fall in the mid-teens. Young’s a nice player and a great guy, but he can’t rebound or defend his position and he’s stopped shooting 3s (like basically everyone else here). There have been some bright spots amid the carnage. Shabazz Muhammad has emerged as a legitimate force in the post, nailing quick-trigger jump hooks, drawing a heap of fouls, and crashing the offensive glass like a madman. He appears to have recently discovered that something called “passing” is allowed in basketball, though most of his assists have come when passing has been the only option — as an inbounds passer, and the covered guy on a two-on-one. Chase Budinger has finally perked up, and Zach LaVine has had bursts of exciting competence amid the troubles anyone would experience playing point guard at 19 on an awful team. Enjoy the upcoming top-five pick. Please make better use of it than You-Know-Who would. The league’s vaudeville freak show rolls on, with Kobe Bryant upchucking one of the very worst games you’ll ever see from a high-volume scorer Sunday against the Kings — an 8-of-30 festival of contested 22-footers, with nine Kobe turnovers tossed in as a free sideshow. Opponents have outscored the Lakers by 13.3 points per 100 possessions with Bryant on the floor, per NBA.com. The Lakers have flipped that figure almost on its head when Kobe sits, destroying teams by about 11 points per 100 possessions. The sample size is small, and Bryant is going up against top opposing units as a starter for a terrible team; Jordan Hill and Wesley Johnson, the Lakers’ other full-time starters, also have ugly splits by this metric. But they’re not as ugly as Kobe’s, and the Lakers’ positive scoring margin without him is massive — about equivalent to Golden State’s league-best mark. Bryant leads the league in shot attempts and usage rate. He is shooting 37 percent. No one in NBA history has faced so little accountability. It is absurd on its face. Bryant has hijacked the entire organization. None of this really matters. The Lakers were never trying to win this season; finishing with one of the league’s five worst records gives them a good chance of keeping a protected first-round pick they’ll eventually toss Phoenix. No one along the back line plays much defense, though Ed Davis at least tries — while shooting 63 percent on the rare instances in which the orange thing accidentally winds up in his hands. The Lakers are 7-10 since Nick Young returned from injury, and they’ve played stretches of actual NBA-level basketball. It’s all cable-TV filler until their real season begins in July. Quin Snyder has juiced up the team’s offense, and the starting lineup has poured in about 114 points per 100 possessions — a killer mark better than any overall team number, per NBA.com. Utah can be confident it has two cornerstones in Gordon Hayward and Derrick Favors; Hayward has bounced back with a nice all-around season on offense, and Favors is a pick-and-roll beast slowly adding refinement to the rest of his game. Everything else is uncertain. Enes Kanter is a bully with a nice midrange touch, but his defense continues to disappoint. Trey Burke can’t shoot from anywhere, and Alec Burks, struggling with a bad shoulder, has joined him in bricking everything near the basket. They are each among the league’s half-dozen worst shooters on drives, checking in at well below 40 percent, per SportVU tracking data. Trevor Booker hasn’t been the 3-point shooter the franchise envisioned, and the Jazz cannot guard anyone unless the mammoth Rudy Gobert is patrolling the basket. Favors is solid overall, but he’s inconsistent, and he logs a ton of time with four liabilities who struggle with the grunt work of off-ball defense. Utah is 28th in points allowed per possession, but it’s defended at a borderline top-10 rate when Gobert is on the floor. Opponents are shooting just 40.9 percent near the rim when Gobert is nearby, a Hibbertian number. He has no range on offense and he’s turnover-prone; Snyder treasures spacing, and he has been reluctant to pair Favors and Gobert in what could be an impenetrable rim-protecting duo. That would cramp Utah’s spacing, but Gobert has played well enough to make Utah think about how badly it wants to keep Kanter long term. Denver has been bad on both ends, and it falls a notch below Sacramento mostly because the Kings have been better — by a large margin — when they’ve had DeMarcus Cousins. The Nuggets have their own injury issues. Several key players are out, and Danilo Gallinari suffered a meniscus tear right as he began to resemble Danilo Gallinari again. Even so, it doesn’t feel like Denver should rank just 20th in points per possession; Arron Afflalo and Wilson Chandler have provided solid 3-point shooting, and Ty Lawson is dishing dimes at a career-best rate. But Lawson is dealing with a balky ankle, and his shooting has slipped badly from all ranges. The big guys don’t provide enough offense to compensate, and Kenneth Faried, fresh off signing a mega-extension, hasn’t delivered on the scoring promise he showed over the final two months of last season. The team is a mess on the other end. Lawson dies on screens, and for the second straight season, it appears the Timofey Mozgov/Darrell Arthur combination is Denver’s only avenue to solid interior defense. That duo has logged just 106 minutes, and though Arthur enjoys jacking triples, it’s unclear if Denver could survive offensively playing them together a ton. It might be worth trying, though. In the bigger picture, Denver is among a group of playoff hopefuls — along with New Orleans, Phoenix, and Sacramento — who need to realize that the playoff race is probably already over. The Pelicans are in the no. 8 spot, and the rest are just a hair behind them, but that’s the wrong way to look at the standings. The Thunder are going to trample all of these teams soon, claim that no. 8 spot, and reach for something further up. These teams are really hoping someone else stumbles, but even the no. 7 seed Spurs are on a 50-win pace despite a hail of injuries and Gregg Popovich (smartly) throwing away regular-season games in the name of long-term health. It sounds harsh, but barring a major injury, the Western Conference playoff field may well be decided. The Nuggets will figure that out, and they’ll get calls on a bunch of their rotation pieces. Chandler is the best trade candidate, and the Nuggets can sit back and see which playoff team is willing to part with a first-rounder — even a late one — to get him. They’re one of several Western Conference teams in the Josh Smith derby — along with the Mavericks, Rockets, Clippers, and potentially the Grizzlies. The big difference: The Kings have almost zero chance of making the playoffs, though it’s unclear if they understand that. Cousins’s long bout with viral meningitis killed them, and they need to pivot to thinking more about next season and beyond. The inevitable Deron Williams trade talks almost make sense from that perspective, even though Williams is the league’s second-highest-paid point guard while ranking as something like a league-average starter at the position. The Rudy Gay extension wiped away most of Sacramento’s projected cap space for this summer, but if the Kings manage their cap sheet correctly, they could take on Williams’s preposterous salary and still have significant room for the summer of 2016.3 A Williams/Gay/Cousins core might hold some appeal for free agents; Williams isn’t much of a rim attacker these days, but he can hit spot-up 3s, post up smaller guards, and run a functional pick-and-roll to move the offense along. You can’t build a system around his dribble drives, but Williams is still a useful player for teams with other methods of getting the ball close to the basket. Posting up Cousins is among the very best such methods available. He’s shooting 53 percent on post-ups and has earned free throws on 22 percent of those plays, per Synergy Sports. Only Dwight Howard has gotten to the line more often via post plays. Cousins is a two-way monster now. The Kings are smoking teams when he plays and can’t figure it out on either end when he sits. Adding Smith would probably be a risk-free flier; Sacramento can only offer the minimum salary, and he’d be taking minutes from inferior players. Williams is still a stay-away, though. He just makes too much money, over too many years, at a position Darren Collison is filling well enough. This is the one team among this group that cannot give up the dream of a playoff berth. The Pellies have dealt away three consecutive first-round picks to chase the no. 8 seed, and too many jobs are at stake across the organization to cut bait now. It’s fashionable to bash New Orleans for mortgaging the future to construct a flawed present, but the team is unquestionably better today with Tyreke Evans, Jrue Holiday, and Omer Asik than it would be with Nerlens Noel, Elfrid Payton, and a 2015 first-rounder. Improving now was the priority, and in the most basic sense, the Pellies accomplished it. And yet: There were other paths to .500 basketball. The Eric Gordon contract is a disaster, and the convoluted deal that effectively exchanged Robin Lopez and Greivis Vasquez for Evans has probably failed. Evans can’t shoot,4 and though he’s a bulldozer with the ball, his skills overlap with those of Holiday and Gordon. The Pelicans could have kept Lopez, spent the Evans money elsewhere, and held on to their 2015 first-rounder instead of dealing it to Houston for a rim protector (Asik) they would have already had. But what’s done is done. In their present form, the Pelicans overcomplicate things to make up for the weirdness of their thin roster, and the awkwardness hurts them most on defense. The Pelicans rank 26th in points allowed per possession, unthinkable for a team sporting Asik and Anthony Davis. 1. Dante Cunningham, signed recently so John Salmons and Luke Babbitt’s hair don’t have to play as much, is guarding Nicolas Batum at the point of attack. Cunningham can’t really manage that, since he’s a power forward masquerading as a wing player. Batum toasts him. 3. 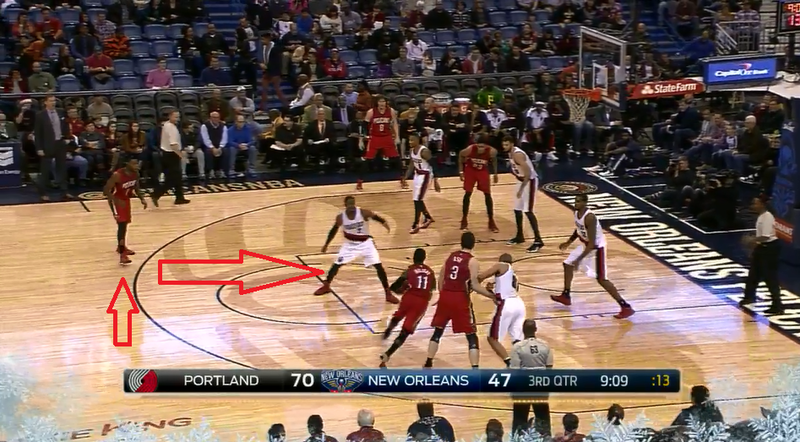 Davis is guarding LaMarcus Aldridge near the 3-point arc, too far away to make any impact. This happens a lot, especially when teams go small against the Anderson/Davis pairing; if Anderson is guarding the bulkiest screen-setter, Davis and his arms are floating around 25 feet from shot-blocking territory. The Pelicans are blitzing people with the Anderson/Davis combo, but they cannot survive on the other end. Cunningham’s presence also makes it easier for teams to defend Anderson, who is slumping from deep; smart opponents put their power forwards on Cunningham and sic a quicker wing player on Anderson. Big men can guard Cunningham fine — he’s one of them — and wings have a better shot sticking with Anderson and closing his shooting window fast. The bench is a tire fire. They’ll sort out the roster, but it will take time. Phoenix tries to avoid gazing at the standings. Hornacek divides the schedule into four-game chunks and displays them in the team’s locker room — the next four home games, and the next four road games. The goal is to go 2-2 over each set of four on the road, and 3-1 at home. “You can’t worry about how far behind you are at this point,” Hornacek says. The team just hasn’t found its groove. Dragic and Isaiah Thomas have missed time with nagging injuries, and Phoenix is still trying to find out what it can do when all three of its go-go point guards share the floor. It misses Channing Frye, less because of Frye’s play than for the void he leaves in the rotation. Phoenix has struggled badly whenever Markieff Morris, by far the team’s best all-around big man, hits the bench, per NBA.com. The Frye/Morris combination last season provided a nice mix of shooting, size, and just enough defense. Phoenix hasn’t found the equivalent this season. Miles Plumlee bonked his way out of the starting lineup, and while Alex Len brings a soft touch and some rim protection, he hurts the Suns’ spacing and fouls a ton. Both Len and Plumlee have struggled at times in a defensive scheme that asks them to leap out far against opponent pick-and-rolls. Smaller lineups with Morris as the only big have deluged teams with scoring, but Hornacek hasn’t trusted such groups to log heavy minutes. This is still a good team — a speed demon that feasts on corner 3s and plays close to league-average defense despite fouling a ton. They just don’t look to be good enough, and that’s fine, considering how young they really are. The Suns will be on the hunt for some help, but they should prioritize next season and beyond in talking deadline deals. Teams will call about all of their point guards, but the feeling around the league is that Phoenix would be most open to moving Thomas. They’ve been covered here and here. It seems inconceivable that a team this talented, smart, and polished could be the eighth-best team in the West, but welcome to perhaps the greatest conference ever. The no. 8 team might end up as the ninth- or 10th-best team in the NBA — and a legit title contender if things break right. The Mavs have to hang here until we see whether they can integrate Rajon Rondo, nab Josh Smith, and improve their porous defense and rebounding. Fun tangent: Remember how Jason Kidd gives his players written tests every game day? Rick Carlisle still does that in Dallas. A couple of weeks ago, he let the Mavs partner up for the test and gave Monta Ellis the right to pick his partner, according to several guys on the team. Ellis picked Brandan Wright. They were among the slowest pairs in finishing the test, and Dirk Nowitzki began shouting about how Wright was a modern-day draft bust. “I killed B-Wright,” Nowitzki remembers. What camaraderie! Two weeks later, bam, Wright is gone. The NBA is a hard business. Here’s where we are: If there are even minor concerns about your play on one end of the floor, you can finish only so high in these rankings. The Clips are 17th in points allowed per possession, and that’s enough to knock a real contender into the no. 7 slot. DeAndre Jordan continues to improve as a rim protector, but he can still get jumpy at the wrong times, and there remain occasional hiccups in the communication on defense between Jordan and Blake Griffin. The bench beyond Jamal Crawford has been unreliable — especially the big-man duo of Glen Davis and Spencer Hawes. Opponents are destroying the Clips whenever one of them is on the floor, though Hawes may just need more time to find his spots in the offense. It’s easy to say the Clips should hold a roster spot for a 3-and-D wing player, but if Doc Rivers can snag Smith at the minimum, the Clips should think about it — even though he’d represent yet another big who needs to live in the lane. Smith could at least work alongside Hawes on bench units and occasionally mix with Griffin or Jordan. Matt Barnes is shooting well enough after a frigid start, and Redick is on fire. This is ridiculous. It has to be wrong. The Rockets are 20-7 even though Dwight Howard has missed almost half their games! James Harden is an MVP candidate — maybe the front-runner! Donatas Motiejunas has emerged as a two-way player, and Houston gutted out a bunch of improbable wins — including an emphatic blowout of Memphis — behind the no. 2 defense in the league! Even Houston’s struggles on offense are misleading; the team has scored at a top-five rate whenever Howard and Harden have shared the floor, including in walloping an undermanned Portland team last night. The scheme is cleaner on defense, with Houston forcing everything toward the sideline, and the coaching staff has whipped out a bunch of opponent-specific wrinkles. Howard has looked explosive since undergoing platelet-rich plasma therapy on his knee, but we have to see him stay on the court. The bench is thin, forcing Harden and Trevor Ariza to play a lot of high-leverage, high-stress minutes; the Rockets acquired Corey Brewer in part to make sure those guys don’t wear down. Kostas “Big Papa” Papanikolaou has managed about as well as possible as a sometime small-ball power forward, considering he’s shooting 36 percent, but that feels like a lineup quirk rivals could exploit in the playoffs. The offense can get a bit gummy in crunch time, though Houston’s isolations are generally effective and the Rox have scored sensationally in the clutch, per NBA.com. We have to see how Motiejunas and Howard function as a tandem over long minutes; the early results, both this season and last, are encouraging. Terrence Jones will come back, and Houston still has trade assets to play with — plus the biannual exception for free agents. Smith is a bad fit on the surface for a team that despises the midrange, but Daryl Morey has long operated under the assumption that talent figures things out. Smith would walk in as Houston’s best power forward, and if his lack of shooting mucks up Howard’s pick-and-roll lanes and post game, the Rockets can separate them. I’ll admit: There are some lingering trust issues from Houston’s playoff flameout against Portland, but the Rox are chipping away at those with their gritty two-way play. The Grizzlies have the league’s best record, 54-20, since Marc Gasol returned from a knee injury in the middle of last season. They’re 21-7 now, and 7-2 against incumbent Western Conference playoff teams — tied for the best such record in the league. They have all the hallmarks of a real contender — the usual beastly defense, plus the best offense of the Grit-’n’-Grind era. They’re just a hair behind Portland in points per possession despite a no-show from Quincy Pondexter and a cold start from Vince Carter, the guys who were supposed to give the Grizzlies the best two-way wing depth they’ve had since Shane Battier and O.J. Mayo helped them upset the Spurs in 2011. Those guys should come around; Carter has perked up lately. We know Memphis is a tough out in the postseason. Russell Westbrook’s knee injury cleared its path to the conference finals in 2013, but it put up strong showings both before and after that — including pushing a healthy Thunder team the distance last season, a series it may well have won had Zach Randolph not gotten himself suspended for Game 7. Memphis is deep at every position; Jon Leuer and Beno Udrih look more and more like solid bench cogs, though Leuer’s play of late wasn’t enough to push Memphis out of the Josh Smith derby. The Grizzlies have made their interest known, per several league sources, and that’s a smart move — if only to keep him away from other contenders. They’ve also kicked around the idea of dealing Kosta Koufos, due a raise in free agency, but they need to tread lightly; Koufos is a key piece off the bench, and the Grizzlies have to be all in for this season. The window is open. There are still questions: The defense isn’t quite as airtight as usual, they’ve slipped on the glass, and two starters, Randolph and Tony Allen, have nagging injuries. They’ve lost three straight to end a tough 5-in-7 stretch, and before that, they needed overtime to eke out wins against Charlotte, Philly, and an undermanned Spurs team. 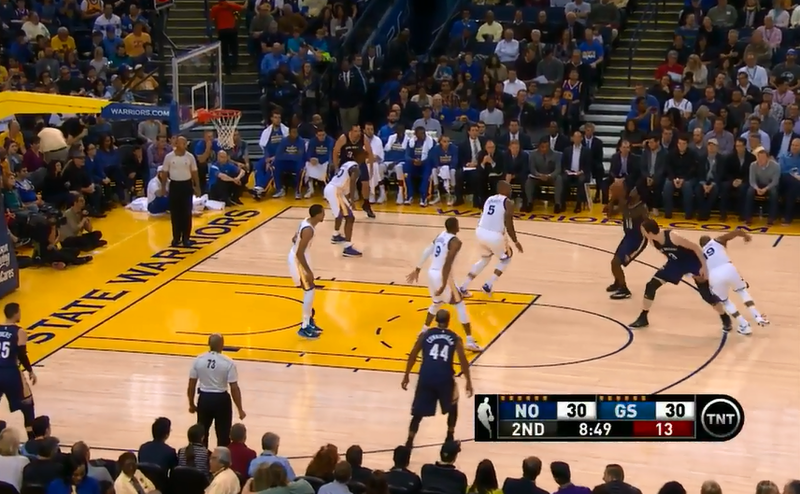 They won’t have enough shooting unless they get more stable production from the Carter/Pondexter pairing. I have been an admitted Blazers doubter for two years. I didn’t believe they could build a decent defense last season. I picked the Rockets to beat them in five games in the first round. I picked them to make the playoffs this season, but also argued they were the incumbent postseason team most in danger of suffering some regression. And so I’m here today asking for forgiveness. You know what this team is? It is businesslike. It is vicious. It is mean. It is completely comfortable in its own skin, and it knows exactly how it wants to attack every opponent. It will pick at a weak spot until it bursts open and blood pours all over the court. Most important: It plays defense and has just enough of a bench, stitching up the weakness that undid Portland over the last two seasons. The Blazers rank third in points allowed per possession, and though they have managed that against a weaker-than-average schedule, it’s clear they feel at home now in the ultraconservative scheme Terry Stotts implemented last season. They don’t have a deep bench, but Stotts is smart about keeping at least one starter on the floor, and the Blazers have been slaughtering teams when both Steve Blake and Kaman are on the court. Those guys mesh well with the starters, and Kaman especially is smart about sneaking through all the space Aldridge creates to snag offensive boards and easy buckets. There is no lineup type that can fluster Portland. That’s a powerful thing. We know what this team is on offense — a well-coached machine of ball movement and shooting, humming right along in the top 10 despite a meandering start from Batum. Aldridge can demand the ball in the post when the Blazers get frazzled, and his combination of height and midrange shooting can force uncomfortable contortions upon opposing defenses. They could use a third reliable bench guy, preferably a wing player, and you can bank on Neil Olshey, the team’s deal-making GM, to work every corner of the trade market; they own all of their first-round picks, plus two movable midsize contracts in Thomas Robinson and Meyers Leonard. Those guys are seeing more time with mascot-abuser Robin Lopez out, but Lopez will be back, and Portland really needs only one of them. Portland might not be contenders on the level of some of these other teams yet, but they’re better than lots of us thought. Do not sleep on Portland. Wake me up when they have their full team. The Spurs are pushing through a wave of injuries similar to the one that wiped out half their rotation for a stretch in the middle of last season, and Gregg Popovich has taken his DNP-Rest game to new levels. Matt Bonner has attempted multiple running hooks in the same game, and Kyle Anderson is out there doing stuff in slo-mo. Home-court advantage is nice, but health and freshness are more important — especially in a conference so competitive that it will be tough for any team to hold serve at home in even just a single series. It’s absurd how good this guy still is. Feel free to drop them down if the injury concerns bring their record closer to the .500 trouble zone. It’s unclear when Kawhi Leonard will return from a hand injury, and Tiago Splitter — crucial for defending Nowitzki and Aldridge types — has barely played. But if the Spurs are healthy, they will be there in the end. The Warriors have gone from stealth contender to obvious contender, and we’ve already detailed what makes them go on both ends — plus the challenges they face reintegrating David Lee and navigating the luxury tax. They’ve been the league’s best team this season, with the no. 1 point differential, the no. 1 defense, and a 7-2 record against the rest of the West’s incumbent playoff teams — tied with Memphis for the best such record. Andrew Bogut’s knee issues are the only real on-court cause for concern. Bogut has had some brutally unlucky breaks throughout his career, but he’s also suffered some general wear and tear — including this knee problem. The Warriors damn near won a round without Bogut last season, and if all of their other bigs stay healthy, they might have just enough depth to pull that trick this season. But winning three rounds is a different story. The Warriors will need a healthy Bogut to do that. During last season’s first round, Rivers told the Clips he’d bench anyone who fell for that play the rest of the series, according to Draymond Green and other sources. It’s incredible teams still fall for it — and a testament to all the dangerous threats the Dubs can sprinkle around the court. When everyone is scary, defenders can get distracted scanning for emergencies. Yup. This conference is nuts, so we might as well get crazy. They’re in 10th, and Kevin Durant is dealing with an ankle sprain after returning from a broken foot. Remember the question that drives these rankings: If everyone’s healthy in April, who are you picking to gut through this conference with all the money on the line? It is very hard to bet against Durant, Westbrook, and Serge Ibaka in their primes. It will be tough to come from the no. 8 or no. 7 spot, and Durant needs to get through this season without any recurrence of his foot issues. But he’s looked great, and the Thunder have outscored teams by nearly 21 points per 100 possessions when all three stars are on the floor, per NBA.com. They were going to be my preseason title pick before injuries to Durant and Westbrook, so they might as well get the top spot here — even sitting in the lottery as things stand today. The Thunder score there, but it’s a lot of work, and we know defenses will load off Roberson and Steven Adams in the playoffs. We also know that Scott Brooks will be slow making rotation changes, play bad players too many minutes, and run isolation after isolation in crunch time. All of those obstacles that have torpedoed the Thunder before remain. But it’s not as if they’ve been far away; they played the Spurs even in the conference finals last season once Ibaka returned from a calf injury. This is a bet on the power of both star players and incremental improvements. Adams can’t shoot, but he’s leagues better than Kendrick Perkins at scoring off cuts, snagging putbacks, hitting the occasional post-up bucket, and generally doing NBA athlete–level things. Morrow and Jackson can handle minutes at the 2 should Roberson’s shooting prove fatal, and at least one of the up-and-down Roberson/Perry Jones III/Jeremy Lamb trio figures to be ready to contribute at some point in the playoffs. Brooks also showed a slightly quicker trigger tweaking the rotation during last season’s playoffs. It was still more Civil War soldier than John Woo action hero, but at least the trigger existed. Trust me: No one wants to see these guys in the first round, or any round after that. Everyone in the West is terrified of them. Every kind of statistic, copious game- and film-watching, and chats with executives. In a minimum of 10 games played. That depends on how the league works the new national TV money into the salary-cap calculation, an issue yet to be decided. He’s cooled off after a hot start from deep. If you think your team is being slighted, please reread that sentence. Griffin’s uptick in midrange jumpers amounts to a recognition of that. Why Did Detroit Waive Josh Smith? Why Does He Shoot From There? And Where Will He Go Next?